93 Liberty Street, Alsdorf Hall, was built in 1915, as the home of the Alsdorf School of Music and Dancing, a historic music education and dance school begun in 1849 by Professor Dubois Alsdorf. Professor Dubois Alsdorf, son of freed slave, George Alsdorf, began a Newburgh dance academy which directly contributed to some of the most significant music and dance trends of the 19th and 20th century, impacting Newburgh and her residents but also the ballroom dance and musical trends that shaped musical theater and Hollywood in the 20th century and beyond. The school instructed students in dance, and eventually music, tracking the rise in popularity of the social dances of the 19th century, such as the quadrilles, waltzes and polkas popular with the newly wealthy upper classes. In Newburgh, as various fortunes were made, an emerging, wealthy class sought the same leisure activities enjoyed by the new money aristocracy in Saratoga and New York, and Professor Alsdorf being an astute businessman as well as a wildly talented one, met that demand. By teaching popular dances, and networking with trendsetters, such as Nathaniel Parker Willis, editor and friend to Washington Irving and Nathaniel Hawthorne, Alsdorf’s school influenced developing dance and musical forms. Music and dance began to shift at the end of the 19th century from purely European styles to a uniquely American style which blended African American and European styles of dance and music. By the early teens of the 20th century, jazz music and dances influenced by Ragtime music, such as the Foxtrot, were popular at the Academy. The school continued into the middle of the 2oth century, but first a look at its beginnings. Dubois Alsdorf , son of freed slave, George Alsdorf, attended a Newburgh district school with the children of many of Newburgh’s prominent white families, such as James Graham, future judge. As an adult Professor Dubois Alsdorf would start one of Newburgh’s first brass bands with white librarian, Charles Estabrook–likely a schoolmate of Alsdorf’s– and father of noted Newburgh architect, Frank Estabrook. But as a young black man aspiring to make his way in wealthy Newburgh, Dubois no doubt found many avenues to upward mobility closed to him. Instead of one of the traditional career paths forward many of his white classmates would take, Dubois apprenticed indirectly with groundbreaking black musician Francis B. (Frank) Johnson. Image of Francis B. 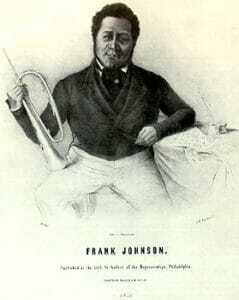 (Frank) Johnson, groundbreaking composer, bandleader, and impresario from the 19th century whose work influenced later forms of music such as ragtime. Johnson, born a free man, was an accomplished black marching musician who played for regiments in the Philadelphia area including the Washington Guard’s Company Three (later the Washington grays). Johnson was a trained fiddler (an Irishman trained him) and bugle player, and he and his highly proficient band all of whom excelled at both string and brass instruments toured the East Coast, performing at resorts from Saratoga to Cape May. He began publishing music, performing at society dances in Boston and New York and establishing a national name for himself. Eventually, Johnson and his group of musicians decided to travel abroad to England and while there to perform for Queen Victoria. The first American (not to mention black) band to travel to Europe at that time, Johnson’s band was received by Queen Victoria while in England. Johnson was also introduced to the Promenade concert style of music popular in Europe, and this style influenced a change in his musical direction and future productions. Promenade concerts consisted of overtures, waltzes, instrumental solos and quadrilles, and Johnson brought this style of music back to the United States with him. Johnson also became adept at improvising while he played adding vocal as well as novel flute lines to his performances. His signature style blended traditional, classical music with improvisational styling and can be seen as a forerunner to the improvisational style which is a hallmark of jazz. One of Johnson’s musical traveling companions to England was William “Mons” Appo (his brother-in-law) and it was Appo to whom Dubois Alsdorf was directly apprenticed. Appo, though part of Johnson’s Philadelphia contingent, eventually moved to New York, and he settled there and opened a studio. Dubois Alsdorf toured with Appo to the same places Johnson had taken Appo, from Saratoga to Cape May and elsewhere, playing the styles of music and dance that were raging in the best social circles. Alsdorf learned what was popular while he played with the best. Alsdorf was training with some of the finest and most popular musicians in the nation. At the time Johnson was attracting literally thousands to his Philadelphia concerts. 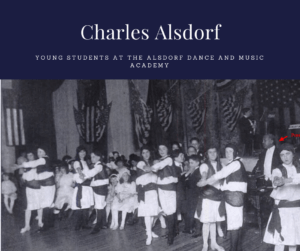 A trained Dubois Alsdorf returned to Newburgh and began the process of becoming “Professor” Alsdorf, performing as a violinist for dance instructors. He started his own band traveling to the same places Appo had taken him. Eventually, the Professor opened his musical education and dance academy which stayed in business from the later 1800s through several decades of the 20th century. The school was located at various addresses in Newburgh, teaching the youth as well as the adult populations of Newburgh, and running formal dance parties for prominent families as well as a yearly NFA graduation party. Ulysses J. Alsdorf was a pianist and a nationally-known, published songwriter. In a pre-electronic media age, musical and dance styles and conventions were not spread by radio or television. While Thomas Edison’s phonograph disseminated musical styles and impacted culture, in the very early 1900’s it was dance halls and stage performances and minstrel shows that spread both music and dance trends. Just as Frank Johnson had introduced the Promenade style popular in Victorian England to Philadelphians, Bostonians and New Yorkers, Professor Dubois his band and his sons, as well as their peers throughout the country influenced and introduced styles in the dance classes and music halls where they taught. It was a kind of tin pan alley classroom experience. It isn’t even a stretch to imagine that professional ballroom dancers such as Irene and Verne Castle (also dance school owners) were influenced by dance academies such as Professor Alsdorf’s Academy, by this time in its seventh decade, as they developed the dances they became known for, such as the Castle Walk. These dances borrowed from ragtime dance influences and were modified to suit white audiences. What played well and was received well in dance schools naturally filtered back to the leading dancers of the day propelling them to stardom, and encouraging them to produce even more variations of the types of dances that gained popularity. Eldest son Charles Alsdorf served on the board of the Dance Society to which Irene Castle was an advisor, and corresponded with the Society’s New York office, inviting notable ballroom dancers from the Society to Newburgh to perform for the public. Many of his New York colleagues such as the Castles and Oscar Duryea (as well as the dancers Mr. and Mrs. G. Hepburn Wilson, whom Charles brought to Newburgh for a dancing exhibition) worked on Broadway, with Ziegfield, and with Hollywood studios. The highly accomplished Alsdorf sons educated hundreds of students in music and dance including a man who would ultimately go on to become the longtime Music Director at Newburgh Free Academy, Albert A. Nebling. Nebling, a Columbia University graduate, credited Ulysses Alsdorf with shaping Nebling’s musical education during his formative years as Ulysses student. Thus, the Academy’s reach bridged centuries and styles and was felt not only in the dance halls, and centers of culture, like New York City, but also in the classroom, influencing many generations following Ulysses Aldorf’s tenure as Professor through Nebling. The Alsdorf family’s influence and impact on Newburgh ran deep in many other ways. Alsdorf’s son, Simon, was the chair and principal organizer of the 1895 concert that successfully helped fundraise needed monies for St. Luke’s Hospital. Simon was an impresario who brought a variety of shows to Newburgh, including minstrel shows. He also worked with internationally known classical musical performers, such as pianist Jesse M. Shay. While it is difficult to research and write about such a stunning family knowing that their lives must have been horribly constrained in a culture permeated by institutional racism, which prevented them from both receiving the credit owed for major contributions to American culture and participating fully in that culture, it is important to get the historical lineage (especially regarding culture) correct. 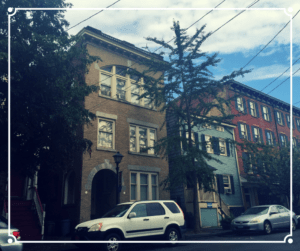 When walking the Historic District in Newburgh, buildings like the Alsdorf on 93 Liberty Street, stand as silent reminders of the human lives, such as the Alsdorfs, that shaped Newburgh, and also the much larger American cultural legacy.